New Urban Arts: ART PARTY! Join New Urban Arts in celebrating the creative voices, ideas and original artwork of Providence high school students. 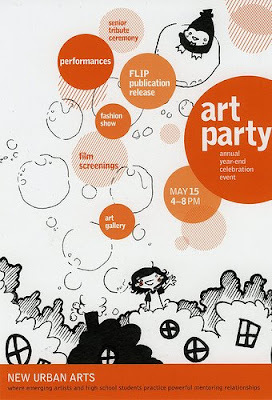 Attend our year-end Art Party Friday May 15 to experience the magic at New Urban Arts' studio. It's our biggest event of the year and marks the culmination of a yearlong collaboration between artists and young people. The event is free and open to the public and located at 743 Westminster Street, Providence, RI. Free and open to the public. Our gallery doors open at 4pm. Enjoy a free copy of our annual zine publication, FLiP. Watch spoken word performances and film screenings. Hear moving tributes to our graduating seniors and volunteer artist mentors at 5pm. Featuring interactive art installations, a student art sale, a live music performance, and the highly anticipated fashion show. In our silk-screen studio, students and artist mentors will be printing a collection of illustrated initials called "Communi-tee." Bring a t-shirt to be screen printed onto and take home original, wearable art!